The European Union guarantees Human Rights according to Article 53 of the Charter of Fundamental Rights of the EU and Article 6 (1) of OF THE TREATY ON EUROPEAN UNION. Violations of the ECHRFF can be reported to the European Court of Human Rights. The Human Rights Committee of the UN is responsible for complaints about the ICCPR. freedom of information in Article 19 (2) of the ICCPR and Article 41 and 42 of the Charter of Fundamental Rights of the EU. Access to information is now firmly recognised as an internationally guaranteed human right, with decisions at the Inter-American Court of Human Rights and European Court of Human Rights, and global recognition by the UN Human Rights Committee. The European Court of Human Rights ruled 14. April 2009 in application no. 37374/05 by TÁRSASÁG A SZABADSÁGJOGOKÉRT ./. Hungary that access to public documents to be a human right according to Article 10 of the ECHRFF. In 5 German federal states Bavaria, Baden-Württemberg, Hesse, Lower Saxony and Saxony access to information laws are missing. 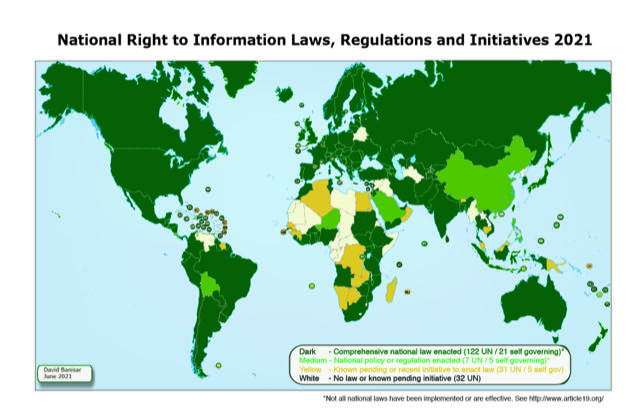 125 states with 5.9 billion inhabitants adopted either FOI laws or constitutional provisions. Citizens in 5 states with half of the population in Germany lack this human right. The federal law of Freedom of Information has too many exeptions and violates international principle of maximum disclosure. Comparison with laws from 111 other counntries places Germany on 105th rank, i. e. 5.5 billion people have better access laws. Germany tried to remove the human right of access to public documents and other human rights (Appendix 25) from the Draft General Comment No. 34 on Article 19 ICCPR (see page 17 appendix 26). The Human Rights Council supported 6 of 8 suggestions of the Baltic Sea NGO Forum. In complaint No. 40901/02 to the European Court of Human Rights 1 of 13. November 2002 violations of freedom of opinion have been filed. This case is because a integration helper violated 2 the law on legal advice 16. for supporting Jewish immigrants for free. Germany is the only country in the world where it is forbidden to altruistically give free legal advice. In case BARTHOLD v. GERMANY and STAMBUK v. GERMANY freedom of opinion was violated. In case Vogt vs. Germany ( - 7/1994/454/535 - EuGRZ 1995, 590 - ) 3 , Germany was condemned because of violations of freedom of opinion and freedom of association by the European Court of Human Rights. But the German courts seem not to respect this judgement 4 and try to continue as before: new cases in 2004. Unfair trials (Violation of Article 6 of the ECHRFF 14 ): Deumeland v. Germany, BOCK v. GERMANY , PAMMEL v. GERMANY , PROBSTMEIER v. GERMANY , KÖNIG v. GERMANY , ELSHOLZ v. GERMANY , SOMMERFELD v. GERMANY , KLEIN v. GERMANY , MIANOWICZ v. GERMANY , METZGER v. GERMANY , H.T. v. GERMANY , HOFFMANN v. GERMANY , P.S. v. GERMANY , JANSSEN v. GERMANY , KIND v. Germany, BECKER v. GERMANY , BÖHMER v. GERMANY, THIEME v. GERMANY , HASSE-ANGER v. GERMANY , NIEDERBOSTER v. GERMANY, VAN KUCK v. GERMANY, HERBOLZHEIMER v. GERMANY, GÖRGÜLÜ v. GERMANY, Storck v. Germany, SÜRMELI / GERMANY 75529/01, Grässer / Germany EGMR 66491/01, Sedef / Germany C-230/03. Washington Post, 31.01.2002: Does Germany Condone Kidnapping? 2004: Polish father not allowed to speak polish to his daugthers. 2006: Petitions to European Parliament. Violation of the human right of freedom of information (including access to public documents) has been filed to the Human Rights Committee of the UN 6. In its report on ICCPR: CCPR/C/DEU/2002/5 of 4 December 2002 Germany claims in point 240 to comply with ICCPR Article 19 (2). But this is wrong because access to public documents is missing. Will the UN Human Rights Committee find out? Will the Commissioner for Human Rights of the CoE promote Freedom of Information? The Human Rights Commissioner writes 28. November 2003, to review the material in the context of a visit.21 Keim v. Germany: ECHR Appl. No. 41126/05. Petition Patients Rights 25. Oct. 2001 to Landtag Baden-Württemberg: The committee of petitions rejects access. The Ministry of Social Affairs rejects as well. Article 10: Decision by the European Court of Human Rights (Fifth Section), case of Sdruženi Jihoceské Matky v. Czech Republic, Application no. 19101/03 of 10 July 2006. The Higher Administrative Court in Schleswig-Holstein (see judgement of 22. June 2005, Az: 4 LB 30/04) ruled that to sell goods which do not meet weight requirements is a secret not to be disclosed: ""Consumer protection is not of constitutional rank. It must step back because ownership (Art. 14 of the Basic Law) is protected by the constitution. Therefore ownership is in this case stronger." The application of access to public documents showing what authorities have measured was turn down although there is a Freedom of Information law in force in the state of Schleswig-Holstein. The Higher Administrative Court is no good advertise for Germany. According to the Federal constitution protection law § 4 (2) there are "Among the liberal democratic basic order in the sense of this law (...): g) those human rights which are part of the Basic Law". Since access to documents is missing in the German Basic Law (Constitution), it is neccessary to add this human right in order to give Germans the same human rights as citizens in other civiliezed countries. The German Constitutional Court often does not give reasons e. g. in case 1 BvR 1057/02 7 about Freedom of Information 8and violates Article 6 of the ECHRFF 9 . The same problem exists for Petitions 10, there is no right to a fair answer (1 BvR 1553/90) 11. Here is an investigation who is responsible for the lack of freedom of information 15 in Germany. The highest Court in the German land Rhineland-Palatinate LG Mainz (1 QS 25/98) 13 stated that the court can not give access to documents (as human rights would demand), because it is the parliament, which would have to give this right. Germany violates Article 46 of the European Convention of Human Rights to obey judgments. The forced membership in the German lawyers bar (Rechtsanwaltskammer) violates Article 20 (2) of the UN Declaration of Human Rights ("No one may be compelled to belong to an association."). Lawyers who are critical to the German legal system can be fired from the bar with the help of a monopoly dating back to a law on legal advice from 1935, which means a Berufsverbot. The German bar (Bundesrechtsanwaltskammer) is the secessor (see § 233 BRAO), of the Reichs-bar (Reichs-Rechtsanwaltskammerder) from 18. March 1933 and constituted (Reich-Rechtsanwaltsordnung) on 13. December 1935. The lawyers bar in Cologne tries (See Krumbiegel Scandal) to fire a lawyer, who promotes Human Rights and his clients interests in clear words. Many citizens protest: Solidarity with RA Claus Plantiko: (click and add line shift) Letter to lawyers bar (Rechtsanwaltskammer). Here is an intervention. Germany is the only country in Europe, which reserved the right not to comply with CoE Recommendation (85) 13 of appointing an independent Ombudsman. The ombudsman was recommended the general competence, to the human rights matters under his scrutiny and, if not incompatible with national legislation, to initiate investigations and to give opinions when questions of human rights are involved. The German Institute of Human Rights (Deutsche Institut für Menschenrechte) was founded on the basis of suggestions of the UN (UN resolution 48/134 of 20. December 1993) and CoE Recommendation No. R (97) 14. The first director Percy MacLean (now again judge at the Verwaltungsgericht Berlin) had to resign, because he monitored human rights in Germany (how UN wished). The opponents favoured to monitor international developments. (See his article: Das Deutsche Institut für Menschenrechte - Vision und Wirklichkeit: Wie soll es nach dem erzwungenen Rücktritt des ersten Direktors weitergehen? Vision and reality: How to proceed?). Especially steering members Mrs. Dr. Hanna-Beate Schöpp-Schilling and Mrs. Barbara Unmüßig opposed to monitor human rights in Germany. Access to these documents about this has been denied. Germany's Constitutional Court decreed that European Human Rights' Court judgments were not binding in German domestic courts: 2 BvR 1481/04. Germany violates Article 46 of the European Convention of Human Rights to obey judgments. OSCE is committed to the human right of access to public documents. Will OSCE observe this violation of human rights in Germany? EUCARS ( European Corruption Analysis and Reduction Service ), institut voigt 19 : Peter Briody : Human Rights Violations in Germany. The Silence of the LLAMS. Letter to EU Commission: Violation of the Treaty of European Union Common Provisions Art 6-2 by the Federal Republic of Germany. Complaint to UN. The German Crimanal Code punishes insult in section 185 and defamation in section 187 which is contrary to international standards suggesting civil code e. g. JOINT DECLARATION 2002 by the UN Special Rapporteur on Freedom of Opinion and Expression, the OSCE Representative on Freedom of the Media and the OAS Special Rapporteur on Freedom of Expression. Details are worked out at the Regional Conference on Defamation and Freedom of Expression, Strasbourg, 17-18 October 2002. “Human rights” refer to those fundamental rights and freedoms essential for human survival, liberty and dignity that have been recognised by the global community and protected by international legal instruments. Human rights are universal. They are the birth-right of every man, woman and child. Result: The Executive, Legislative, and Judicial branches in Germany do not give a guarantee to always support human rights (That were the words the state used against critics). The TREATY ON EUROPEAN UNION, European Convention on Human Rights and Fundamental Freedoms (ECHRFF), International Covenant on Civil and Political Rights (ICCPR) and the Charter of Fundamental Rights of the EU are not followed. According to Article 20 Basic Law: "All state authority is derived from the people." and "the executive and the judiciary shall be bound by law" (given by parliament elected by the people) "and justice". Therefore in Germany a democracy of European type is possible, if members of parliament want it and go for it. The Human Rights Commissioner of the Council of Europe promised to look through the material in the context of a visit: http://wkeim.bplaced.net/files/coe-031128.htm. But who will invite him: the government, the Committee of Petitions, the Committee of Human Rights, the Deutsche Institut für Menschenrechte (Human Rights Institut), the Forum für Menschenrechte or the UN? Do you know more? Please do not hesitate to contact me. PS: Strasbourg, 11 July 2007 CommDH(2007)14: REPORT BY THE COMMISSIONER FOR HUMAN RIGHTS MR THOMAS HAMMARBERG ON HIS VISIT TO GERMANY 9 – 11 and 15 – 20 October 2006, https://wcd.coe.int/ViewDoc.jsp?Ref=CommDH(2007)14&Language=lanEnglish Deutsche Institut für Menschenrechte mit der Beobachtung der Menschenrechte in Deutschland beauftragen, nationalen "Aktionsplan Menschenrechte" entwickeln. The Human Rights Commissioner writes 28. November 2003, to review the material in the context of a visit: http://home.broadpark.no/~wkeim/files/coe-031128.htm.